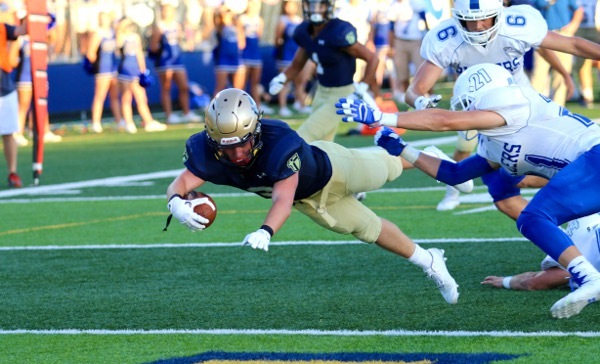 Kpreps.com would like to congratulate Susan Goodwyn for submitting the winning photograph for Week 1 of the Kpreps Friday Night Photo Contest. The photo captures Drew Hicks of St. Thomas Aquinas scoring a touchdown in the Saints’ 42-13 win over Gardner-Edgerton. Hicks led Aquinas with 113 rushing yards and three touchdowns on 14 carries. For this winning photograph, Susan is now eligible for our 2016 Grand Prize including $500 in cash. Susan also submitted the 2015 Grand Prize winning photo announced in late August with the release of Kansas Pregame Magazine.